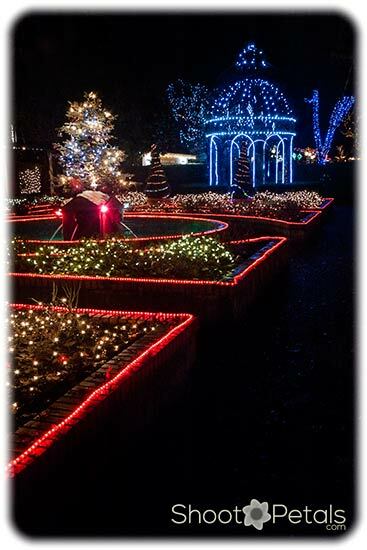 Park and Tilford Gardens Festival of Lights isn't well-known outside of North Vancouver. It's not a large botanical garden by any means but it's worthwhile taking a jaunt across to see it! I found out about this botanical garden from two of my North Vancouver friends a few summers ago. My first visit was in September with one of those friends... her husband volunteers there. Festival of Lights at Park Tilford Gardens. A view of the rose garden looking toward the pergola in blue lights. The fall garden hooked me, totally. I'd never even heard of it and I'd driven past the area so many times. It's well hidden in the corner of Park and Tilford Shopping Centre! The winter Festival of Lights was a super opportunity for some night photography. Hadn't been out at night with my camera for a long time so it took a bit of brushing up before I left home. I got some video for you, too. It'll only take a couple of minutes for a quick tour around... it's short and sweet! This garden is so special. If you'd like to see more of it, with flowers, click here for photos from the autumn visit to the Park and Tilford Gardens in North Vancouver. Accessibility - Park and Tilford Gardens are wheelchair accessible. Cost - How many gardens are still free these days? Well, Park and Tilford Gardens is a non-profit, teaching garden and it's totally free! They would be grateful if you'd make even a small donation! It's a popular place for weddings or wedding photos and if you're interested, contact their office well before your date at 604-984-8200. Light at Park Tilford Gardens, Festival of Lights. Textures applied in Photoshop and a black frame added. Once you're through the entrance, there are a few different paths you can take... but, best to keep going straight ahead. On your left is the first theme garden - the Rock Pool. There were a few deer all lit up in white lights, an elf casting his fishing pole - keep watching - you'll see him catch a fish! And if you follow the pathway, jolly old Saint Nick is perched on an incline behind the fountain. Rudolph's looking gung-ho tonight, ready to lead the other three reindeer on Christmas eve - check out his red nose! There are strings of blue lights along each side of the path... your eyes follfow them across the picture... the same way they guide you while you walk through the garden. See that perfect S-curve... remember your photo composition rules? Okay, say bye-bye to Santa and head out through the circular colonade. Lots more deer along the path, hanging baskets and views across to the rose and perennial gardens. Keep going and when you see the snowman and a sign saying North Pole, you're at the Park and Tilford Gardens' Oriental Garden! Japanese maple lit up in Park Tilford Gardens, Festival of Lights. 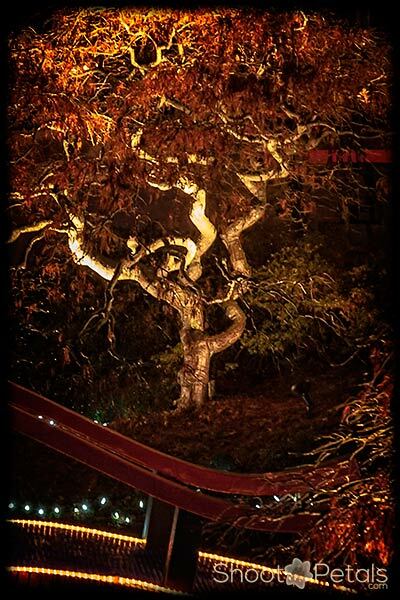 The tree has wonderful curves and looks eerie in the lights. This is the Japanese Garden. The Moon Gate is so inviting, all lit up -- the pond on the other side reflects the white and blue lights from the walkways and the Japanese Maples. The branches are so eery-looking with all the shadows and lights. This is a super garden to photograph. I just love the Harry Potter feel of the space! Such creepy shadows and shapes! Finished? Then slip out the back gate and you're in the Native Garden - at the wooden footbridge. Keep following the path to the Park and Tilford Gardens office building. Stand in front and look all the way across the Rose Garden. The photo at the top of the page is the scene you'll be looking at... the pergola is at the opposite end. Here's another photo but taken in vertical view. Take both vertical and horizontal shots of scenes. PS. You know you need a TRIPOD for night photography, right? 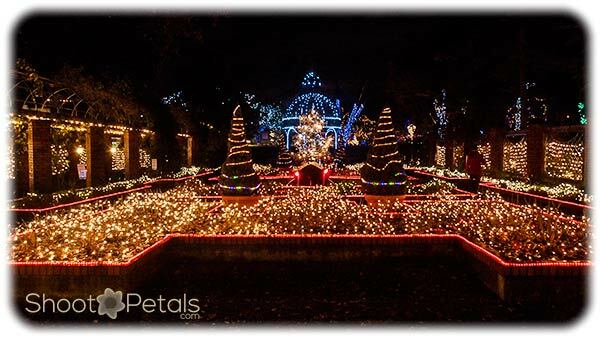 Park Tilford Festival of Lights, Rose Garden with the pergola in blue behind. A vertical photo with nice angles to the raised gardens. Walk to the end, past the pergola and there's Santa in the herb garden, waving to everyone. When you meet up with the family of carolers, you're standing beside the greenhouse. Unless you want to make another round, you'll be right back at the main gate. 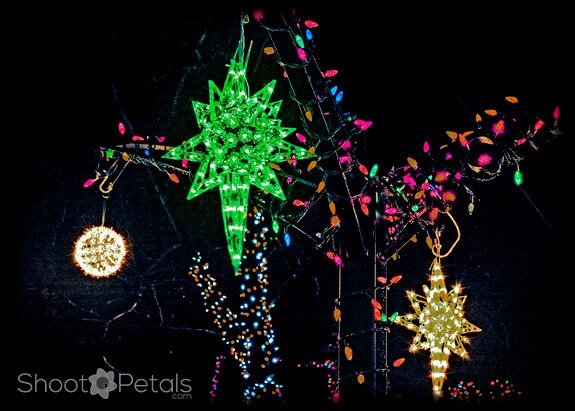 Here's where you can check for their next Festival of Lights, or keep up with the goings on in the garden during any season of the year. The gardens are part of the Park and Tilford Shopping Centre so you'll find the garden section listed at the top. Click on it to see Special Events or News. Park Tilford Festival of Lights, Carolers. Nice reflections in the walkway. Several texture and adjustment layers to the image in Perfect Photo Suite. The scene best fit a square composition. The Park and Tilford Gardens is so well planned that it feels a lot larger than just 3 acres. All the theme gardens flow into the next so smoothly. I took my camera on my first trip around and got photos. Then I did the route again to catch it all on video. 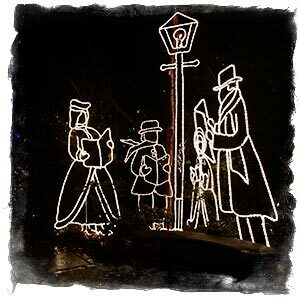 You'll get a better idea of Park and Tilford Gardens Festival of Lights if you give both the video and photos a viewing. Here's a bit of fun. 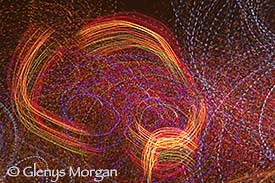 My friend was playing around and swirling her camera in circles to paint light trails. We experimented and changed our exposures to come up with something pretty. I set my zoom lens to 70 mm and my exposure was 6.0" at f/8.0. Set your camera to manual mode... press the shutter and move the camera in a circle until the shutter closes. Six seconds is enough time to record these lights and the light trails are well exposed. By the way, you can also press the shutter and then quickly zoom your lens to get another weird effect. That takes practice but it's fun. You can't really see the photo 'cause your screen's just too small. So you won't be able to check out your results till you download your photos and see them on the big screen! 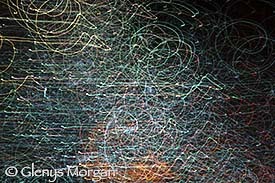 Have you ever seen the very long exposure photos of stars moving across the sky at night? How do they do it? The camera stays still while the stars move. You can get multiple exposures or leave the shutter open for a very long time, so you see the trails the stars and planets leave on the image as they move across the sky. Experiment a bit. My ISO is 400 for all shots. On manual setting - dial in your exposure. Choose an aperture of (f/16.0) - take several shots and change your shutter speed each time. For example, 5 shots (f/16 at 2", f/16 at 4", f/16 at 5", f/16 at 6", f/16 at 8"). Then set your aperture to f/4.0 and take another 5 shots... use the same shutter speeds as before. Still having fun? Try f/8.0 and the same five shutter speeds. That's what's great about a digital camera... take as many shots as you want and it doesn't cost you $$$ like film would. Another plus is that digital is a super teaching aide - you get to see the results immediately. No waiting a day or two for the film to come back. We learn best when the feedback is immediate! the shutter speed (2", 4", 6" and 8"
What does your aperture control? Do you know what your shutter speed controls? Can you tell from your pictures? The rain held off, but it was damp and chilly... that's the usual Vancouver winter weather! Gratefully, there's a Starbucks across from the Park and Tilford Gardens front gate... ah, yes, a steamy chai latte before hitting the road! If you like the idea of night photography, get a Basic Photography book or google it. There are thousands of articles on the web. And check out exposure in my learn basic photography section. Be prepared for the next festival of lights wherever you happen to be!